What’s shakin’ forex friends? Did y’all catch the pound’s moves after the U.K. inflation report was released? If not, worry not because we’ve got another potential market-mover coming up – the U.K. retail sales report for July. For the newbie forex traders out there (as well as veteran forex traders who want a refresher), the U.K. Office for National Statistics (ONS) releases the seasonally-adjusted monthly estimates of the amount bought and spent in the British retail industry. These estimates are based on a survey conducted among 5,000 retailers that are carefully chosen in order to best reflect the overall economy. Aside from the large sample size, retail sales data are important to both forex traders and policy makers since the data provide hints to the overall health of the retail industry and, more importantly, are used to determine the strength of consumer spending. 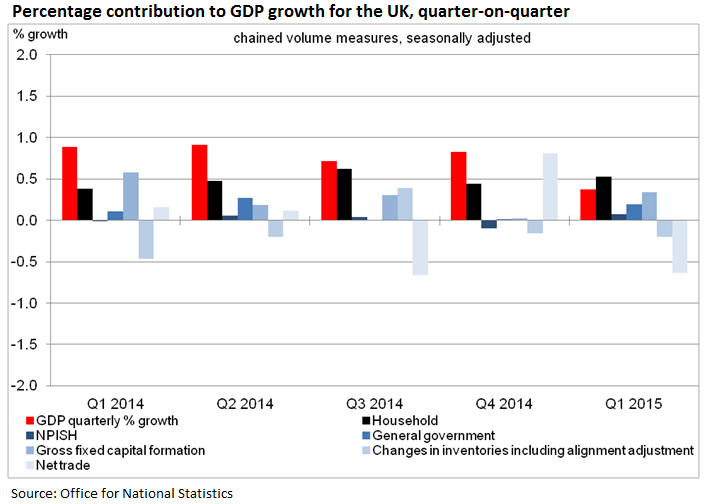 And consumer spending, otherwise known as household consumer expenditure, has been the backbone of the British economy. In fact, Q1 2015’s quarterly GDP growth was powered mostly by consumer spending, as you can see on the chart below (it’s the black bar), which is why the release of retail sales data usually injects some volatility into the markets. Last time around, forex traders were eagerly anticipating a 0.4% increase in quantity bought for the month of June after a 0.2% increase back in May. Unfortunately, the ONS reported that retail sales volume actually went down by 0.2% month-on-month due to falls in sales volume from food stores, household goods stores, and petrol stations. And to add salt to injury, the amount spent by consumers also went down by 0.1% month-on-month, which is why forex traders reacted by dumping the pound rather hard. The ONS tried to play off the poor readings by emphasizing that quantity bought in June 2015 was 4.0% higher when compared with June 2014, and that year-on-year sales volume estimates have been increasing for the 27th consecutive month. Most forex traders weren’t convinced, however, as fears that Q2 2015 GDP would see a slowdown began to infect the market like a plague. As a result, seller follow-through was sustained until the next day. This time around, the consensus among forex traders and economists is that sales volume will be back in the green with a 0.4% increase. Personally, I’m not very sure if the actual reading will meet the market’s expectations since the GFK consumer confidence index decreased from 7 points to 4 points, which means lower levels of optimism (and spending). In addition, the retail price index (RPI) decreased by 0.1% month-on-month, which may be a sign of lower consumer demand. Of course, I could be wrong since the average earnings index did increase by 2.4% in the April-June reporting period while inflation remained low during the same reporting period, so the British people are seeing growth in real disposable income, which they can potentially use to buy more stuff. Forex traders usually have a knee-jerk reaction to the actual data relative to the market’s expectations, so better-than-expected readings usually cause the pair to spike higher while worse-than-expected readings cause forex traders to dump the pair like last time. As to whether or not there would be some sort of follow-through depends on the prevailing sentiment for the pair. In the short-term, the path of least resistance seems to be to the upside due to demand for the Greenback caused by the better-than-expected readings for both headline and core CPI. In the longer-term, the BOE’s recent not-so-hawkish tone could continue to weigh-in on most pound pairs, though.